I think you could make your own miracle hair growing hat with a light fixture and half a dunce cap. Or perhaps a fez. No matter how thin your hair may be, this remarkable new scientific invention is absolutely guaranteed to give you a brand new growth of hair in 30 daysâ€”or it costs you nothing. Don’t send a cent. Just mail coupon below. 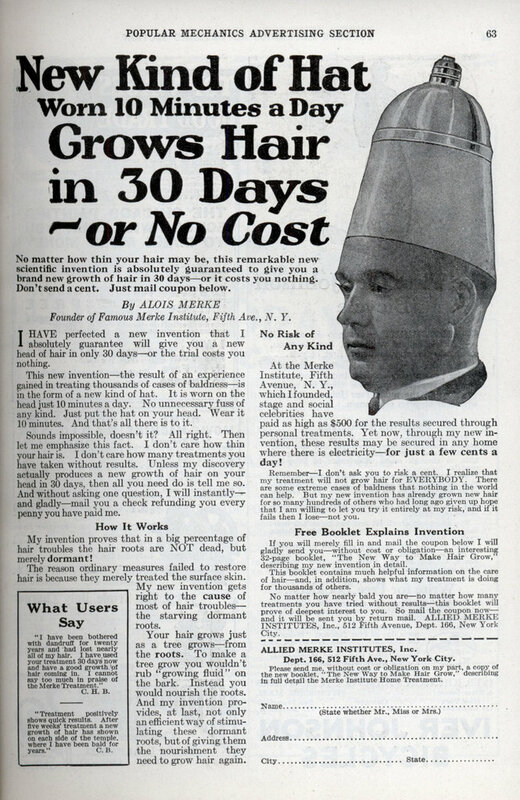 By ALOIS MERKE Founder of Famous Merke Institute, Fifth Ave., N, Y.
I HAVE perfected a new invention that I absolutely guarantee will give you a new head of hair in only 30 daysâ€”or the trial costs you nothing. This new inventionâ€”the result of an experience gained in treating thousands of cases of baldnessâ€”is in the form of a new kind of hat. It is worn on the head just 10 minutes a day. No unnecessary fuss of any kind. Just put the hat on your head. Wear it 10 minutes. And that’s all there is to it. Sounds impossible, doesn’t it? All right. Then let me emphasize this fact. I don’t care how thin your hair is. I don’t care how many treatments you have taken without results. Unless my discovery actually produces a new growth of hair on your head in 30 days, then all you need do is tell me so. And without asking one question, I will instantlyâ€” and gladlyâ€”mail you a check refunding you every penny you have paid me. My invention proves that in a big percentage of hair troubles the hair roots are NOT dead, but merely dormant! The reason ordinary measures failed to restore hair is because they merely treated the surface skin. My new invention gets right to the cause of most of hair troublesâ€” the starving dormant roots. Your hair grows just as a tree growsâ€”from the roots. To make a tree grow you wouldn’t rub “growing fluid” on the bark. Instead you would nourish the roots. And my invention provides, at last, not only an efficient way of stimulating these dormant roots, but of giving them the nourishment they need to grow hair again. At the Merke Institute, Fifth Avenue, N. Y., which I founded, stage and social celebrities have paid as high as $500 for the results secured through personal treatments. Yet now, through my new invention, these results may be secured in any home where there is electricityâ€”for just a few cents a day! Rememberâ€”I don’t ask you to risk a cent. I realize that my treatment will not grow hair for EVERYBODY. There are some extreme cases of baldness that nothing in the world can help. But my new invention has already grown new hair for so many hundreds of others who had long ago given up hope that I am willing to let you try it entirely at my risk, and if it fails then I loseâ€”not you. If you will merely fill in and mail the coupon below I will gladly send youâ€”without cost or obligationâ€”an interesting 32-page booklet, “The New Way to Make Hair Grow,” describing my new invention in detail. This booklet contains much helpful information on the care of hairâ€”and, in addition, shows what my treatment is doing for thousands of others. No matter how nearly bald you areâ€”no matter how many treatments you have tried without resultsâ€”this booklet will prove of deepest interest to you. So mail the coupon nowâ€” and it will be sent you by return mail. 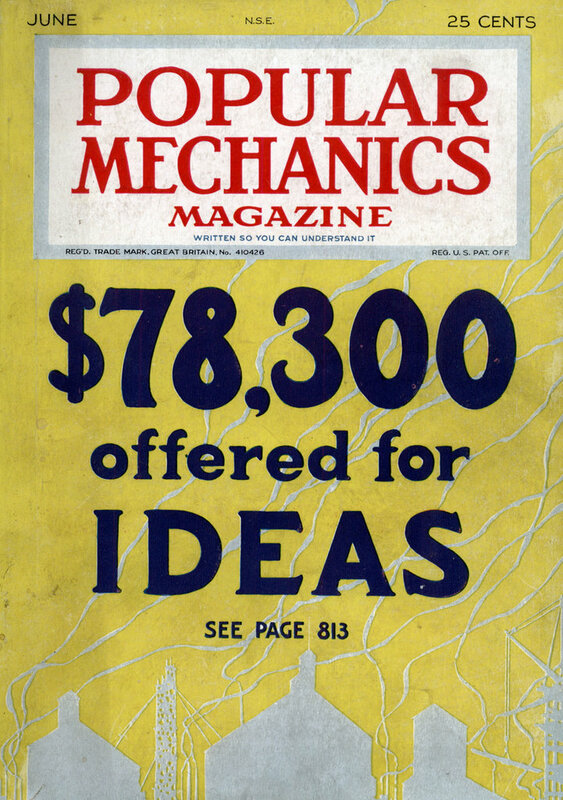 ALLIED MERKE INSTITUTES, Inc., 512 Fifth Avenue, Dept. 166, New York-City. A hat that grows hair?! What’s next; shoes that grow toenails? Oh, science! Will you never cease to amaze us? Demelza: You obviously can’t “cant c” a date of June 1924 either. Back in the day, you could buy just about any quack cure you wanted on Fifth Ave. in NYC.